Charlie was only days old when all that he knew and trusted in the world disappeared - his family in South Africa abandoned him. The unlucky little hippo weighed only about 60 pounds and was so tiny and weak that he likely would have died on his own. So, authorities captured him and took him to the Thula Thula Rhino Orphanage. It was there they discovered he was even sicker than they thought. He was peeing through his still-attached umbilical cord, a scary condition that can sometimes resolve on its own. But in severe cases, it may require surgery. The tiny hippo's caretakers waited and hoped. And little by little, Charlie began to feel more like himself. "I love relaying good news, and we have good news on our orphan hippo, Charlie," Karen Trendler, Charlie's caretaker at Thula Thula, wrote in a Facebook post on Thursday. "The patent urachis (urinating through the umbilicus) has resolved without the need for veterinary or surgical intervention." ... and really loves his early morning strolls. 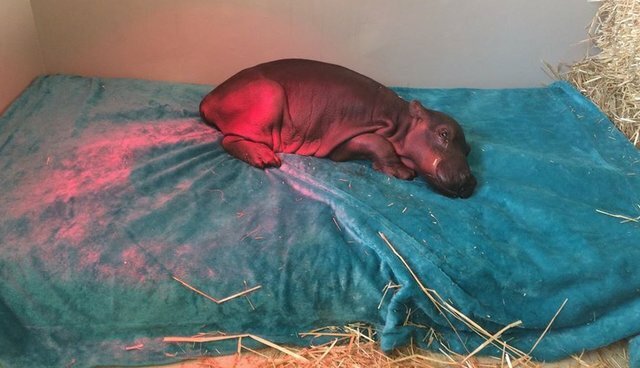 "The little hippo is gaining strength rapidly and whilst his weight is still a little low (it takes a while for orphans to catch up) he has a huge attitude and appetite," Trendler wrote. If you'd like to help orphans like Charlie, consider donating to Thula Thula here.